Scientologists from around the world gather inside the giant marquee Friday, October 5, to mark the evening’s epic event—the first of three nights of festivities toasting the humanitarian help and accomplishments supported by the International Association of Scientologists (IAS). 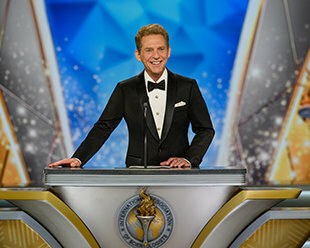 A standing ovation greets Mr. David Miscavige, Chairman of the Board Religious Technology Center, as he prepares to host the first of three days and nights celebrating the IAS. The night continues on an upward trajectory, soaring over a landscape filled with humanitarian accomplishment over the past 12 months and courtesy of the legendary IAS-sponsored initiatives. DEFENDING PARENTAL RIGHTS IN DETROIT The Citizens Commission on Human Rights (CCHR), in partnership with Civil Rights Attorney Allison Folmar, fought injustice on behalf of parents’ rights, taking on 29 cases and winning all of them. CUTTING CHILD DRUGGING ACROSS THE ITALIAN BOOT In Italy, CCHR’s fight against a screening drive aimed at spiking child mental illness diagnoses resulted in a Supreme Court mandate declaring that no child may be screened without parental consent. PROTECTING MISDIAGNOSED UKRAINIAN YOUTH In the Ukraine, CCHR exposed and changed the law against falsely labeling youth as “legally incompetent,” restoring both their freedom and their human rights. SCORING FOR HUMAN RIGHTS IN COSTA RICA In Costa Rica, the Youth for Human Rights booklet became an official publication of the country’s World Cup soccer team, spawning a movement through all 82 districts and reaching 2 million people. EMPOWERING THE PRECEPTS FOR NEPAL The Way to Happiness Nepal empowered over 100,000 students with the 21 precepts, effecting a significant drop in school bullying and resulting in a governmental partnership with the nation’s schools. MAKING MUSIC FOR A DRUG-FREE MALAYSIA Drug-Free World Malaysia toured under a Punk Rock anthem, “Do Music, Not Drugs,” and replayed to thousands of local students and 1.2 million citizens, altogether inspiring a plunge in drug-related crime. A GLOBAL TOUR FOR A DRUG-FREE EARTH Drug-Free World events throughout the African continent distributed nearly 140,000 booklets; pledge drives amassed 50,000 signatures in Colombia; teams blanketed Super Bowl 52 in Minnesota, USA, with 230,000 booklets; and at the FIFA World Cup volunteers spread over half a million booklets across Russia—some 15 million The Truth About Drugs booklets were distributed in the past year. VOLUNTEER MINISTER AID—NO MATTER WHAT The Scientology Volunteer Ministers aided in disasters around the world, including at earthquakes in Taiwan, monsoons in Nepal, typhoons in Japan and fires in Greece as well as across California. POWERING UP PUERTO RICO In Puerto Rico, after the deadly hurricane Maria hit the island dead-on, Volunteer Ministers arrived immediately to deliver more than 150,000 vital supplies and subsequently drove a “do-it-yourself” solar power movement that lit up some 300,000 homes. IMMEDIATE RELIEF IN THE SOUTH PACIFIC After a 7.5-magnitude earthquake rocked Papua New Guinea, Volunteer Ministers flew a search and recovery program dropping five tons of food and supplies, aiding 18,000 islanders at 19 rescue centers. ANSWERING THE CALL IN SOUTH AMERICA’S RING OF FIRE In the wake of Guatemala’s “Mother of Volcanoes” erupting, Volunteer Ministers distributed more than 10 tons of clothing, food, hygiene kits and medical supplies to its base, constructed nearly 200 houses and trained local disaster personnel to restore their region. VOLUNTEER MINISTERS GOING THE DISTANCE In the past year alone, Scientology Volunteer Ministers traveled 640,000 miles to bring succor to over 5 million people hit by natural and man-made disasters. Underscoring the evening’s theme of relentless devotion toward the achievement of peace, education, decency, social justice and a drug-free and crime-free existence across the planet, the 2018 IAS Freedom Medal Winners stood tall. Each provided a stellar example of unflinching commitment to humanity. The first night of a weekend-long fête that commemorated and celebrated the IAS and its evergreen expansion. Mr. Miscavige at Friday evening’s pulsating event had Scientologists and guests from 65 nations cheering in jubilation. CHURCH OF SCIENTOLOGY STUTTGART The September grand opening of the stunning Church of Scientology in Stuttgart, Germany, was highlighted during the night’s moving presentation. Mr. Miscavige, Chairman of the Board Religious Technology Center, leads the celebration of the unrivaled successes of the past 12 months with diverse stories, film presentations and honored guests. A night packed full with purpose and passion hits maximum volume as Mr. Miscavige previews the Scientology Network’s bold new chapter with the announcement of the Fall Season premiere, Monday, October 8. SCIENTOLOGY NETWORK FALL SEASON Dozens of new episodes will showcase every aspect of the world’s youngest major religion and its global humanitarian mission over the coming months. In fact, since launch on March 12, 2018, the Scientology Network has been viewed across 237 countries and territories worldwide in 17 languages. The standing ovations keep coming as Mr. Miscavige underlines each success, with thousands of Scientologists rising to their feet again and again. “We are experiencing such massive expansion you really get the message that ‘something can be done about it,’” said one Scientologist attending Friday night’s event. BLACK TIES AND BRIGHT SMILES. The spirit of the first night’s festivities rolls right on over into Saturday evening as the grand marquee transforms into the annual IAS Patrons Ball. The traditional black-tie dinner and entertainment gala recognizes ever-expanding numbers of members supporting the year’s humanitarian triumphs as revelers fill the dance floor into the evening. AN OCCASION TO CELEBRATE. The weekend concludes with the annual IAS Charity Concert, a joyous musical event that welcomes some 1,500 local residents. The concert features TV and recording stars, internationally known performers and various music genres from swing to jazz. CHEERS FOR CHARITY. The night of dance and celebration sees the true superstars of the evening, five local charities, receiving donations to strengthen their community activities in keeping with the tradition first instilled by L. Ron Hubbard, here at his home. The town of East Grinstead appears as if from a storybook, a medieval marketplace in the northeast corner of West Sussex—south of London, north of Brighton, lush with farmland, trees and botanical gardens. It is after all a town whose name means “green place,” and borders a nationally recognized Area of Natural Beauty (AONB) that includes the Ashdown Forest of ancient lore. The destination is off the beaten path, just enough to be blissfully tranquil, but still within hopping distance of Piccadilly Circus. So it was a train of lights flowed through the twisting country roads and arrived at the grand gates, pouring forth wave upon wave of attendees, their anticipation abounding. This is Saint Hill Manor, home of Scientology Founder L. Ron Hubbard, and once again center stage for the annual gathering of the International Association of Scientologists. The weekend-long gala is an opportunity for parishioners from all corners of England and more than 65 nations the world over to celebrate humanitarian purpose and accomplishment. And as the crunch of stone and gravel below boots and high heels echoed down the drive, dusk turned to night and an evening of wonder was now poised to begin. Indeed, the IAS began in 1984, and was founded at Saint Hill to unite, advance, support and protect Scientologists and the Scientology religion so as to achieve the Aims of Scientology. In honor of that tradition, this year Mr. Miscavige outlined a year of outstanding successes powered by an irrepressible force where all advances are aligned toward humanitarian salvage and expansion. Chief among those successes was the historic grand opening of a stunning new Church of Scientology in Stuttgart, Germany. At the beginning of September, a ribbon fell on the 78,000-square-foot facility in the center of the industrial capital. Attendees of Friday evening’s anniversary celebration in East Grinstead were presented highlights of the dedication ceremony, featuring captivating speeches of dignitaries honoring the occasion as monumental for the past, present and future of not only Germany but all of Europe. The night continued on an upward trajectory, soaring over a landscape filled with humanitarian accomplishment over the past 12 months and courtesy of the legendary IAS-sponsored initiatives. All began with life-saving efforts to eradicate abuses in the field of mental health through the Citizens Commission on Human Rights. Miraculous accounts of help, support and human brotherhood, further showcased Foundation for a Drug-Free World, and its never-ending drive to deliver The Truth About Drugs; United for Human Rights, championing the fact that all men, women and children are protected by the Universal Declaration of Human Rights; The Way to Happiness, the worldwide phenomenon containing the non-religious moral code written by L. Ron Hubbard restoring basic decency and trust in Mankind; and the unrelenting wave of Scientology Volunteer Minister support providing assistance at 19 different calamitous locations in the past year. In Costa Rica, where the Youth for Human Rights booklet became an official publication of the country’s World Cup soccer team, spawning a movement through all 82 districts, reaching 2 million people in totality. The Way to Happiness Nepal empowering over 100,000 students with the 21 precepts, effecting a significant drop in school bullying and resulting in a governmental partnership with the nation’s schools. Drug-Free World Malaysia touring under a Punk Rock anthem, “Do Music, Not Drugs,” and replaying to thousands of local students and 1.2 million citizens, altogether inspiring a plunge in drug-related crime. Drug-Free World marches and events in South Africa and across the continent distributing nearly 140,000 The Truth About Drugs booklets; drug-free pledge drives amassing 50,000 signatures in Colombia; Drug-Free World teams blanketing Super Bowl 52 in Minnesota, USA, with 230,000 booklets; and at the FIFA World Cup in Russia spreading over half a million booklets from the Black Sea to the Red Square; altogether disseminating more than 15 million The Truth About Drugs booklets across 19 time zones of Earth in the past year. The Scientology Volunteer Ministers (VMs) aiding in disasters around the world, including at earthquakes in Taiwan, monsoons in Nepal, typhoons in Japan and fires in Greece as well as across California. In Puerto Rico, after the deadly Hurricane Maria hit the island dead-on, Volunteer Ministers arrived immediately to deliver more than 150,000 vital supplies and subsequently drove a “do-it-yourself” solar power movement to light up some 300,000 homes. After a 7.5-magnitude earthquake rocked Papua New Guinea, Volunteer Ministers flew a search and recovery program dropping five tons of food and supplies, aiding 18,000 islanders at 19 rescue centers. And in the wake of Guatemala’s “Mother of Volcanoes” erupting, Volunteer Ministers distributed more than 10 tons of clothing, food, hygiene kits and medical supplies to its base, constructed nearly 200 houses and trained local disaster personnel to restore their region. In total, Scientology Volunteer Ministers traveled 640,000 miles to bring succor to over 5 million people hit by natural and man-made disasters. In Austin, Freedom Medal recipient and Executive Director of CCHR Texas, Lee Spiller, ran an unending drive to stop psychiatric abuse within the state’s mental health system. Lee zeroed in on multiple incidents of torture and inhumane treatment of foster children and seniors, subsequently exposing a grand scheme of handouts to line doctors’ pockets. He ultimately saw to the closing of 172 criminal mental health facilities and the passage of 43 legislative actions protecting individuals—all in the name of upholding human rights. In the Philippines, Jorge Perez de Tagle introduced the Davao Police Chief to the 21 precepts of The Way to Happiness and then ran a pilot program with police officers knocking on doors and giving the booklet to suspected drug dealers, inspiring a significant drop in murders. Jorge subsequently took the program to Manila and personally taught the precepts to thousands more police officers. After which, he continued on to bring his moral education message to the National Military. All told, de Tagle engendered a movement reaching millions throughout his nation and helping achieve a 38 percent drop in crime in the Philippines. And in Mexico, where twin brothers Dan and Ari Agami worked to change an alarming national drop-out rate by introducing L. Ron Hubbard’s Study Technology into local schools. The immediate impact saw teachers trained in 600 schools—with one Mexican state surging to the top of National Education Rankings. They channeled their momentum into the production of 21 educational films for students across 17 nations. Altogether, Dan and Ari trained 33,000 individuals, empowered 60,000 teachers and permanently paved the path to new futures for over 1.6 million students. At which point, a night packed full with purpose and passion hit maximum volume as Mr. Miscavige previewed the Scientology Network’s bold new chapter with the announcement of the Fall Season premiere, Monday, October 8. Dozens of new episodes will showcase every aspect of the world’s youngest major religion and its global humanitarian mission over the coming months. In fact, since launch on March 12, 2018, the Scientology Network has been viewed across 237 countries and territories worldwide in 17 languages. The spirit of the first night’s festivities rolled right on over into Saturday evening as the grand marquee transformed into the annual IAS Patrons Ball. The traditional black-tie dinner and entertainment gala recognized ever-expanding numbers of members supporting the year’s humanitarian triumphs as revelers filled the dance floor into the evening. The weekend concluded with the annual Charity Concert, a joyous musical event welcoming some 1,500 local residents. The concert featured TV and recording stars, internationally known performers and various music genres from swing to jazz. But the true superstars of the evening were the five local charities awarded donations to strengthen their local activities, in keeping with the tradition first instilled by L. Ron Hubbard, here at his home.